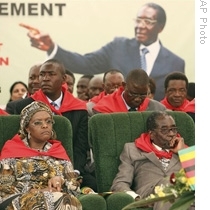 CHINHOYI, Zimbabwe (AFP) — President Robert Mugabe told followers on Saturday at his lavish birthday party to respect the new power-sharing government but vowed to press on with seizures of white farms. The extravagant celebrations were held against a backdrop of economic ruin and came weeks after the veteran leader joined a unity government with long-time rival Morgan Tsvangirai. “Under this arrangement I want it known, as some of you were thinking we are no longer in power, we have an inclusive government with the president at the top, followed by the two vice-presidents, then the Prime Minister Tsvangirai and two deputy prime ministers. “This is a result of the vote in which we did not do well. Let us not complain too much about it. Let’s accept things as they are,” said Mugabe, who turned 85 on February 21. But he also stressed that his controversial land reforms policy launched nearly 10 years ago and involving the seizure of farms from whites for redistribution to landless blacks, would not be forsaken. The land reforms have been blamed for the food crisis in the former grain exporter as many of the beneficiaries lack both the skills and means to farm. “There are farms which have been designated in accordance with our land acquisition laws and offer letters given to the new farmers, let not the original owners of the farm refuse to vacate those farms,” Mugabe told thousands gathered to celebrate his 85th birthday. An offer letter is the document given to successful applicants who have applied to take over farmland. “We are not going to listen to the excuse that some farms went to the SADC (Southern African Development Community) tribunal. That’s nonsense. We have our own courts here,” he said. Mugabe lost the simultaneous first-round presidential poll but won a later run-off unopposed after Tsvangirai pulled out citing violence against his supporters. The veteran president, who has ruled Zimbabwe non-stop since independence in 1980, blamed former colonial power Britain for his party’s poll defeat. “They (British) imposed sanctions which resulted in some basic commodities being unavailable so that the people would be disgruntled with the party. “Some of you thought about your tummies and children and sold out the country,” he blasted. Mugabe supporters raised more than 250,000 US dollars (200,000 euros) for Saturday’s celebrations which included a birthday cake weighing 85 kilogram’s (187 pounds). The party was held north of the capital Harare in the town of Chinhoyi in Mugabe’s home province of Mashonaland West. Mugabe’s old foe and current Prime Minister Tsvangirai, who has been rallying the donor community for five billion dollars in aid and investment, was not at the celebrations despite initial reports he would attend. The country desperately needs money to rebuild schools, hospitals and sewers after a decade of economic collapse compounded by country’s long political travails. Several members of Mugabe’s ZANU-PF party have farms in Mashonaland West and conditions are considerably better than the rest of the shattered country with a university and one of the best-equipped state hospitals. Zimbabwe‘s healthcare system has fallen apart with over 83,000 people affected by a cholera epidemic that has killed more than 3,800. The country is also battling severe food shortages amid hyperinflation which has rendered the Zimbabwean dollar useless. The World Food Program reported last month that the number of people without food was estimated at 6.9 million — more than half the population. Yeah what do you expect. Mugabe is equivalent to the re-thugs in the United States that sank the economy. Wealth belongs to them, that is it.They continues to fly in their expensive jets, owns more than 3 homes each, but cry foul when Mr Obama tells them that he will give some incentives to the main stream. I cannot stand Rush Limbaugh. He needs to move to Zimbabwe.Him and Mugabe can become good buddies. Really.